Description: D&H GP39-2 7416 (ex-RDG 3416) lined up with sister units at the Bethlehem engine terminal in April, 1977. Description: D&H GP39-2s 7610 and 7416 (ex-RDG 3416) ready to pull out of Allentown yard in April, 1977. Description: A colorful lash up lead by lighting stripped 7606 leads a freight in June 1977. Date is approximate. 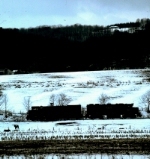 Description: A trio of former Reading Lines GP39-2's line up elephant style at Binghamton, NY on December 26, 1977. Description: D&H GP39-2 7416 rests with 7402 at the Bethlehem engine terminal. Description: Waiting at the fuel pad. The GP39-2 is still in Reading "candy apple green." It was delivered #3416 in 1974. 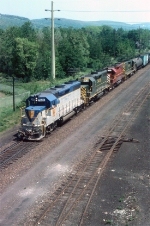 It was later renumbered 385 (D&H Class ERS-23), before being reclaimed at the end of lease by its owner CSX in 1991. It's still on their roster. The RS11 was delivered to New York Central in March 1960 as NYC 8009, but was not accepted along with five other units. She was re-sold to D&H (class ARS-18) and labored on The Bridge Line until scrapping. Description: An Eastbound climbs Richmondville Hill. Description: Power for an Eastbound backs into the Oneonta yard. Description: An Eastbound freight rolls into Cobleskill with a green GP-39-2 and 2 N&W geeps. Description: Diesels are lined up at the mechanicville engine terminal, including the Bicentennial unit 1776, fourth back in the consist. Nice catch on Independence Day!! Description: A D&H e/b Mercury rolls through Bound Brook on the former LV main with two exRDG GP-39-2's(7416, 7414) and exLV GP-38-2 7315. Description: Passing horses, almost a B&W effect. Description: EDNW's power coming out from the pit at 19:55. Description: During the Guilford reign, it was possible to see just about anything at East Binghamton. This Pocono Northeast unit was actually there for work, as the D&H also did some contract work for a variety of area shortlines. Description: Former READING locomotive showing it's heritage. Title: First anniversary for GP39-2 7416 with the D&H! Description: It was just past the 1st anniversary on the D&H for former RDG GP39-2 3416 after being transferred from the Reading Lines at the formation of Conrail. A number of the former RDG GP39-2's were taking a breather at Bethlehem on April 9, 1977.